Sitting in the front corner at Capital Tea, Kevin enjoyed the last rays of sunshine as the sun slid behind the Rocky Mountains. Exploring the tea shop with my camera, I found a colorful bear wearing a knitted hat and miniature teapots filled with flowers on each table. We met Kevin at Capital Tea not just for tea and goodies, but to give him a surprise gift. At a book signing last fall for his book "The Haunted Heart of Denver" which is filled with ghost stories, I discovered Kevin didn’t have a special pen to use. 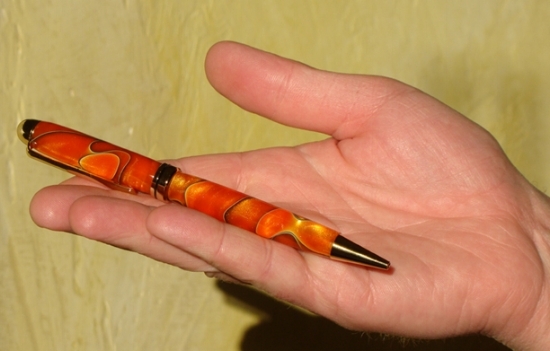 I contacted Dave, owner of Winds of Change contracting company, who makes beautiful pens. Orange is one of Kevin’s favorite colors! After leaving Capital Tea, we met Shawn outside the Colorado History building. Shawn's pen is swirled with teal, which is his favorite color. He signed his book, "Denver's City Park and Whittier Neighborhoods (Images of America)" that is filled with historical photos of Denver. Thank you, Dave, for helping me surprise two great friends with your skilled craftsmanship!